Nintendo confirmed that you'll eventually be able to get an amiibo for your Super Smash Bros. fighter of choice. So Nintendo kind of accidentally discovered that fans will beg, borrow and steal its collectible amiibos to such a crazy extent, that Amazon had to do a kind of bizarre timed-sale strategy for the latest wave of the things to prevent people from buying out its entire stock. Today it confirmed what most people had already guessed: the amiibo train will keep running all the way to the end of the station, in that, eventually all 51 Super Smash Bros. 4 characters will get an amiibo. "In fact, all 51 playable Smash Bros. characters will eventually have #amiibo figures," Tweeted Nintendo of America. It confirmed that newly released DLC characters Mewtwo and Lucas would be getting amiibo, but the number does exclude the recently revealed Roy and Ryu. Nintendo also told us who we could expect to next get the plastic figurization treatment, stating that "New Smash Bros. amiibo based on the Mii Brawler, Mii Swordfighter and Mii Gunner characters are coming soon," and adding "R.O.B., Duck Hunt and Mr. Game & Watch amiibo for Smash Bros. will join the Mii Fighters in September, with Falco coming this holiday." I'm personally interested to see how the Game & Watch amiibo will work. If it's not completely flat and 2D... no sale! Can't get most of them though, and Bayonetta still needs to be made. Except that we literally won't be able to get them because Nintendo is Nintendo and Nintendo loves artificial scarcity and screwing their customers. Look at all the things you won't be able to buy! And they still won't make enough of them to defeat the scalpers. I'd install a browser extension to hide any news about Amiibos, but as soon as I did, Nintendo would flood the market with the few that I'd be willing to buy at $13. Do not encourage Nintendo, you're only making it worse. Jim Sterling phrasing it better that I ever could. They ended up creating a shortage, and now, after seeing the demand of it, continue to further said shortage. Look at their shortage of Splatoon amiibos. You might say people bought them up, but bluntly put, most retailers never even received them. It feels like we have to force nintendo to realize that they can't keep pretending that it is impossible to stock shelves. Skylanders can do it, Infinity can do it, Nintendo is just dragging its feet at this point. Expect all of your smash bros to be released at the big N's leisure as they continue to promote this issue they have been having . Either the scalping problem is way worse where you are, or Australia accidentally got all your stock. I can still walk in to EB Games or JB HiFi and pick up the splatoon amiibos, including the triple pack, most places still have them in stock; And we've had Link officially restocked so many times scalpers don't even bother anymore. Every time a Zelda game came out we got a new shipment of Link amiibos. I keep seeing the complaints that Amiibos coming out are so hard to get, but the last 2 waves have been the opposite. My local EB games still has stacks of Jigglypuff and Greninja which was our last wave, we got more than enough of the wave previous (Wario, Lucina etc) and I think they even have Charizards and Ness' left. We also got a bunch of the Wave 1 amiibos restocked: Marth, Wii fit trainer, villager, little mac. I'm pretty sure Nintendo are trying, but these things do have to be made by someone, in some factory, it's no different than most Skylanders being impossible to find, especially the traps, I don't think TTL is the easiest product to just churn out. It's gotten to the point where I've started assuming an Amiibo can only be manufactured when a neutrino is observed interacting with bigfoot. Hey! Here's an idea- how about they start selling the Amiibo figures without the actual 'Amiibo' stuff in the base? Just for display? Half the appeal of the little blighters is just to have a set of Nintendo figures, so in order to alleviate the demand on the actual 'Amiibo' Amiibo, just sell some non-functioning ones to those who just want them as display items. So.. these Amiibo things are required to play that character, right? Or is it just special skins and stuff? Because having all characters require an Amiibo makes me never want to play a Nintendo game again. You people need to come to Finland to get your Amiibos, there's no shortage here that I am aware of, I haven't seen a single person grumping in the stores that their amiibo of choice isn't available. Well this was hardly news was it? Everyone knew that they would create all of them, right? A wall of text explaining the use of Amiibo (mainly SmashBros). Now the Amiibo (I'm talking aboiut SmashBros for now) is a CPU character that you train. So far the maximum level is 50 and you can tweak them even more by giving them in game upgrades and powers. So for example my Fox started at level 1 and had his stats at "neutral" so strenght 0, speed 0 and defence 0. Then I leveled him up so his level grew to 50, I did this by first having him battle a level 9 CPU Fox (same char) so it would see how a high level CPU fights (it keeps in memory how opponent battle and counters their fighting strategy, but this was in low level learning). Then when it grew to about level 25 and started being on par with the other CPU:s (I also had it battle in 4 man freeforall fight after level 15) I started battling against it myself until it reached lvl 50. I did this with different character types so it would understand there are heavy/fast/magic/closecombat/etc fighters and how to fight them the best way. Then when it reached level 40 I started to feed it equipment. Equipment works like this: if you have a str (strength) equipment, it gives for example 50str but gives minus points on defence, def items give + on def but - on speed and speed is + on speed but - on str. Depending if the item has some special ability it might give more or less minus on the other stat. A good ability might give -40def, on a str item, while a bad ability might give -20def. A good ability might be that when KO:d, you have a 5% chance of starting the next life with a smash attack ready, and a bad ability might be that your shield regenerates 50% slower during the whole match. So my Fox now has the ability that if he gets first hit in a game he becomes invincible (mario star) for 10 seconds. Then I've trained him to shoot his laserbeam attacks as the first thing he does (by playing as Fox and spamming the B button when playing against the Amiibo). Since Fox is a fast character I've given him the stats of str and def boosted, so his str stat is now 120 and def is 40 or 50 I think, while I've kept his speed at 0. He is a though opponent and if I haven't played Smash for a few weeks (like now) I can still beat a level 9 Fox fairly easy, but put this guy/Amiibo against me (no items and flat map) and I'm screwed no matter what character I play. So this is how they work in Smash, then in MarioKart your own MiiCharacter gets a costume that a little bit resembles the amiibo char (helmet mainly) and they are implementing similar stuff into other, coming games. So far nothing crucial, in Splat00n the Amiibo unlocks some special features in single player campaign (you can choose your weapon to play the single player with) but nothing more radical what I've understood, and the single player is boring according to me so no use in getting those. So it's a fun little gimmick and the toy is fairly good on the eye when it stands on the table in front of the TV, I've been thinking about getting a second one soon. But as I said, calling it DLC is a bit much so far as there isn't any crucial content being held away which might lessen the actual gaming experience, mainly just some extra content that might give you a few hours of playing around with. Or that's how I see it. I know people seem to hate preordering with a bloody passion, but that has generally been the "safe" way of acquiring one. The Captain Falcon I bought was literally the only one my Gamestop had, because I was the only one who had preordered it. I think I've just accepted that any character that isn't a mainstay Nintendo icon just isn't likely to stay in stock. so its a way to take your version of the character around the place, to friends or whatever. That's kinda cool I guess. Yeah, pretty much, also if someone has another Amiibo you can always see who has "trained it better", Smash has 8 player mode so with just 6 players you can always throw in 2 Amiibos to fill the blanks (Level 9 CPU:s aren't that good if someone has played a little more). But yeah, it can be played on every WiiU console so taking them with you to friends and using them there is an option. 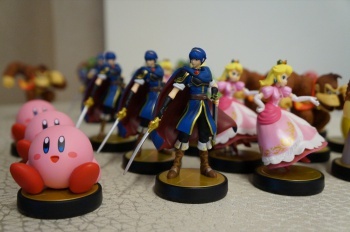 Essentially amiibos are used for special functions in compatible games. What is does varies based off what game and what amiibo. Mario Kart 8 for example unlocks Mii costume options while Hyrule Warriors give weapons and other bonuses depending on the amiibo (Zelda series amiibos give weapons related to that character while the others give random bonuses). In the case of Smash it spawns an AI version of the character that you can train, equip and level up.